Being the type of person that can go out to dinner at 10pm and still be there eating, drinking and talking at 2am I am probably not the best person to write about nightlife in Kypseli. For me a night on the town is mezedes, tsipuro, dinner and wine and a nightcap of more tsipuro, usually at Bakalogatos. By the time I leave there and walk past all the cafes and bars the last thing I need to do is keep drinking. Nightlife in Kypseli revolves around the same places that are the day life of Kypseli. The cafe bars, or what they call cafeterias in Greece go from being places to hang out and drink coffee and talk about your problems all day, to bars where you can drink and talk about your problems all night. Each cafeteria has music which caters to the clientele of the moment so for example The Happening, where all the old men and women from the neighborhood go for coffee and to read the paper in the morning, plays pop music at night for the younger people. SCRY has a nice selection of mixed drinks, wines and beers including several imported German beers on draft and Guinness and Chimay among their bottle choices. Foibos at #19 Fokionos Negri is a small bar with a very faithful clientele and they play jazz, blues, some rock and pop too. 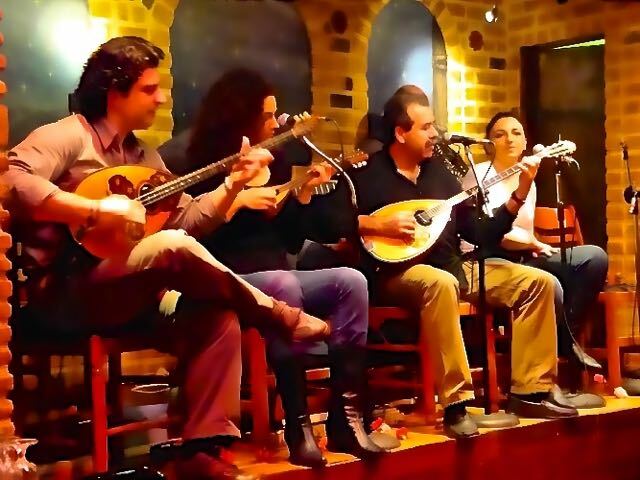 They also have live rembetika music (Greek blues) some nights, folk singers and even the occasional rock or jazz band. The owner is Julia and her two sons are Greek/Australian and speak fluent English. They also own the new cafeteria/restaurant/bar called Orfeas which also has live music on weekends and is large enough to host bigger bands and larger crowds with room for dancing too. It is a full service restaurant with a large international menu too for those people who want to eat and party in the same place. Usually you will see signs posted on the windows of closed down businesses for whatever shows a bar has coming up and many of the cafe bars have live music on weekends. Tristoixo is a mezedopouleion at the bottom of Fokionos Negri and across Patission Street on Agathopouleos 15 which has live music every night and really good food to go with it. My new go-to place for Ouzo and Meze is Bioletta at the very top of Fokionos and above the square. It is a hole-in-the-wall cafeneon, frequented in the daytime by old men who have been coming there for years. 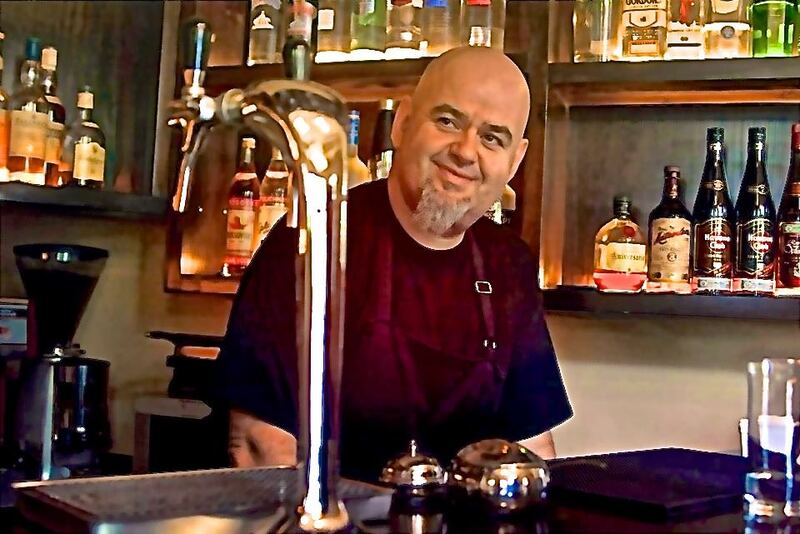 But when his father retired, Elias took it over, brought in his pal Alex who had been cooking for private clients in Mykonos villas, and created an ouzeri with great food and really good music too. If you want an authentic experience go here, but not too many of you or you may make it less authentic. Onaraki is not so easy to find but it is at 32 Syrou Street sort of behind the Kypseli Market. It is pretty much a rock/blues/metal place and they have live music too. Also Foka+Negra at 32 Fokionos Negri where if you are lucky you may catch George Zikos and Zero-Zero. George is a great guitar player and a local hero who also sells guitars and other instruments at Diatoniko.gr at 133 Third of September Street at the intersection with Ithaki Street. The Suzie Q Bar at 53 Fokionos Negri also plays great music and has live shows as well. It is right next door to the Blank Wall Gallery which is one of the best photography galleries you will find anywhere. By the way you can find out who is playing where in the Expats of Kypseli Facebook Group. 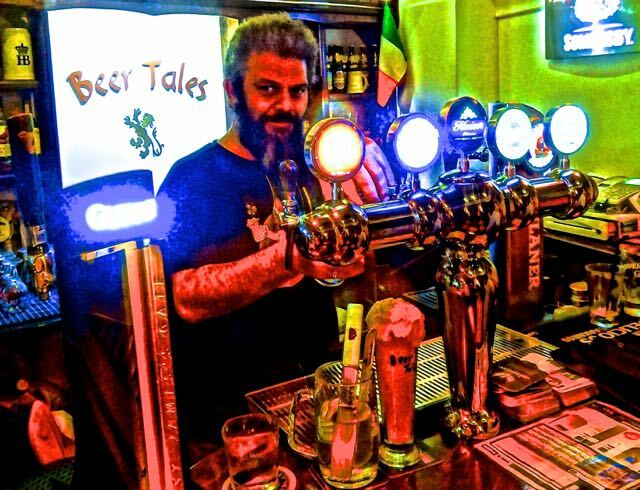 For those who love beer, especially Greek craft beer, Belgian Ales, German Weisbeir and.... well you know who you are, Beer Tales at 52 Fokionos Negri is like a gift from heaven. Not only do they have lots of different beers, served in an atmosphere that might remind you of your favorite bar in college, but they have tables and chairs right out in the park like pedestrian avenue of Fokionos Negri where you can watch people and drink your favorite beers all night. They have live rock and blues music some weekend nights as well as theme parties or beer inspired festivals like Otoberfest. 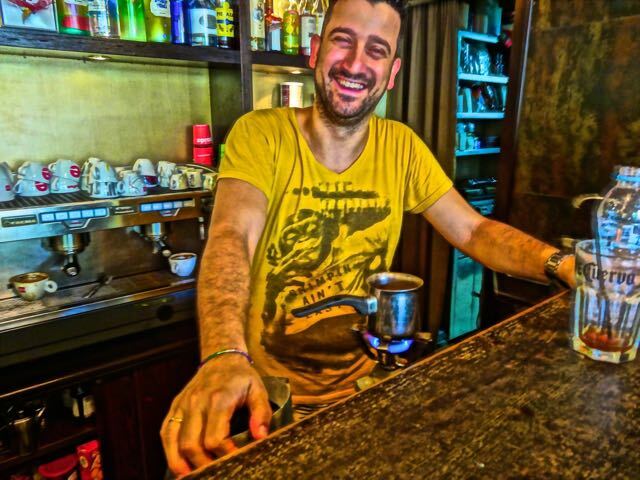 They have coffee and various alcoholic and non-alcoholic drinks like the other cafeterias in the neighborhood and they also serve food and the owners all speak English if you want to come in and talk about beer and Danny is very knowledgeable about Greek micro-brews. (For more about Greek beer see my article Drinking Beer in Athens.) Come on the weekends and hear Kristian Fjellstad and his friends play blues, rock, soul and R&B and you will probably make it your hangout for life. One of my favorite bars in Kypseli, all of Athens and maybe the whole world is a small bar in one of the last remaining neo-classic mansions on Platia Agio Giorgiou (Saint George Square) called Allotivo. For those who like to listen to Jazz, Soul, Rhythm and Blues, and other good music in a small classy bar while drinking fine scotch and whiskies, high-end tequila and hard to find imported beers on tap there is nothing else like it in Kypseli and if you find somewhere as good in the tourist areas you will be lucky. Owned by Andreas Diles, a master of good taste, Allotino is a hangout for the actors and actresses who live in Kypseli. It is hard to find but once you do you will probably come back, especially if you feel like an adult that has been suffering in a world that has been taken over by the young. 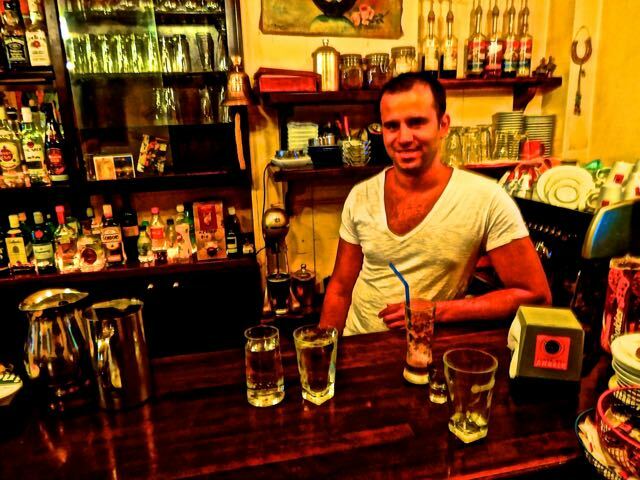 This is one of the best small bars in Athens. It is located at Eptanisou 16 in Platia Georgiou, Kypseli. If you walk down Patission away from the center past the National Archaeology museum and turn right on Tinou Street you will come to it. Tel 210 8215331. They also have a surprising food menu for such a small place with no kitchen. Depending on what you order to drink you may get a complimentary dish of pickled vegetables and the world's best salted peanuts. Its right next door to Oi Nostimies tis Mary's if you get seriously hungry and get a late night craving for one of her super-sized grilled hirino brizolas (pork chops) since she stays open until 2am. Right across the square is Bilatz, a cool young person's bar with tables on the square and live bands now and then. 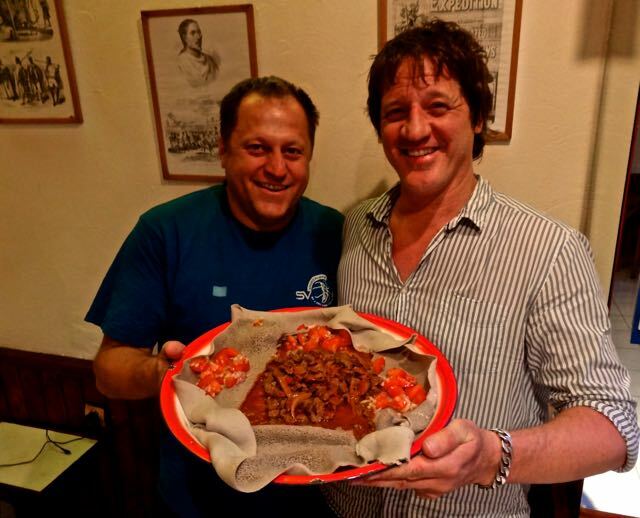 Speaking of after-hours snacking, if you need something to soak up the alcohol and don't want to go all the way down to the restaurants at the meat market for patsa, there are several Ethiopian cafe-bars like the African Kitchen on Kefalonia Street, where you can drink and eat. Most tourists would not even think of going in here but the people are friendly and the food is good, especially when you are drunk. If you get there after hours and the kitchen is closed they will call one of the other Ethiopian places where the kitchen is still open and a guy will jump on his motorbike and go get your food for you. After a long night of partying there is nothing better than some spicy Ethiopian dish. If you want to wander the maze of back streets in Kypseli they are all in a grid pattern and though it is easy to get lost it is just as easy to be found since all you have to do is find Patission Street and go left and in twenty minutes walk you will be in Omonia Square. There are a few nightclubs and bars scattered around Kypseli and some small cafes. On Agia Melitiou Street are a couple of African Nightclubs which my Gambian next door neighbors keep inviting me to. There are a several bars and clubs that look like shady underworld places with scary looking dudes standing watch outside, but who is to say whether they are looking out for the cops or are just there to protect the club from an invasion by people without style. There are lots of small cafe-bars, former cafeneons I suppose that tried to modernize with the times, and when you walk by them and look inside its the same tired old people, playing cards, smoking cigarettes, and looking like they are just passing the time til they die or are carted off by their kids to some old people's home so the apartment can be sold or put on Air BnB. For live Greek music besides the weekend shows on Fokionos Negri there are several established clubs that depending on the crisis may be open but may not. These places are only open in the winter anyway and usually only on weekends, Taxidi stin Anatoli is on the second floor of a house on the corner at 31 Odos Kypselli and Sporadon and I probably walked or drove by it 100 times and never noticed it. To Pontiki is another famous rembetika club in a very large house at 9 Eptanisou and Androu, just around the corner from Platia Agios Giorgos. Ampellofilo is a rembetika-laika music taverna at Samothraki #3 near the intersection of Lelas Karagianni, just up from Agia Zoni near Fokionos. If you are looking for the places where the Greeks go for nostalgic music, places that you are more likely to hear Loukas Daralas songs than George Dalaras and people order whisky by the bottle for 100 euros and don't mind buying several then check these places out. You can actually get through the night without spending a lot of money if you don't get carried away and lose control of your wallet after your first couple drinks, but what's the fun in that? Kypseli is also the theatre district of Athens, sort of the 'off-Broadway' area, with dozens of small theatres scattered around the back streets and some of the main streets as well. Almost all performances are in Greek though you will find that many are translations of well-known plays in English. 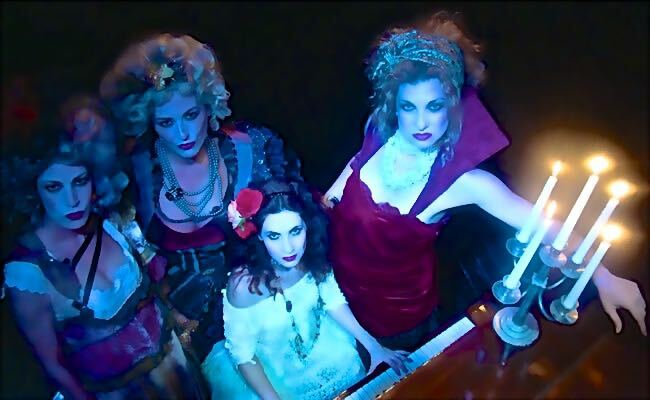 There are also modern interpretations of ancient Greek plays by Euripides, Aeschylus and Sophocles. You can find a guide to performances and reviews in Athinorama magazine, only in Greek though. The Topou Allou Theater at Kefallinias street 17 and Cycladon street in Kypseli has performances in English on Sundays and cooperates with theater groups from all over the world to put on performances in Kypseli and all over Greece. Unfortunately many of the old theaters have been converted into billiard halls, supermarkets or remain empty, awaiting their next incarnation. But there are still plenty left and you can find them in the theater section of the Athinorama magazine of what's going on in Athens which comes out every Thursday. You will need to read Greek but if you are going to the theater in Kypseli you probably already do. Being the theater center of Athens the neighborhood is full of actors and actresses, old and young, who have made their homes here to be close to their trade. You may see an eighty year old woman with bell bottoms, sneakers and dyed purple hair walking confidently down Fokionos or find yourself sitting in a cafe across from a group of women with looks that Hollywood starlets would envy. Its also the home to struggling playwrights, authors, artists, musicians and poets of all ages and stages of poverty and success. 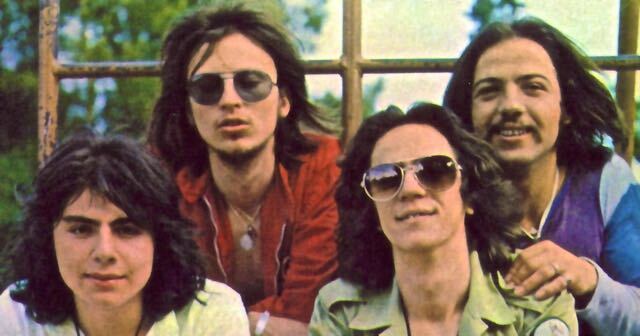 Famous Kypselians include Kosta Tournas of the band Poll (photo), Dorian Kokas of Morka, Demis Roussos of Aphrodites Child, Loukianos Kilaidonis, and a large number of famous actresses and actors, many who still live in the neighborhood. Those who have left still manage to find their way back on sunny afternoons to walk up and down Fokionos and stop at their favorite cafe for a coffee and conversation with old friends. One reason that Kypseli is attractive to struggling artists, students and immigrants is because you can rent a very nice apartment for very little money and it is a relatively safe area. (Meaning there are worse) It still retains a neighborhood identity. Though it is changing from upper middle-class to a mixture of working class, immigrants and artists, there are still a large number of old Kypselians who take pride in being from here and will stay here forever. These are the people who are involved in the saving of what remains of the old houses, the Demotiki Agora and it is their children who stood with them as they battled the police to save the park on Patission street and then sang and danced at the concert which followed. 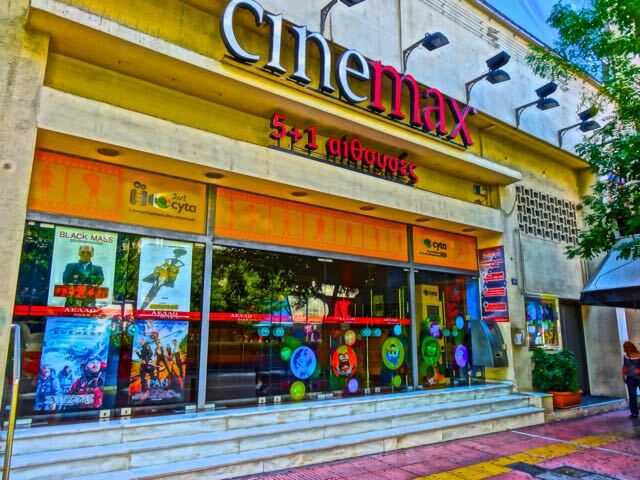 Kypselli has a number of movie theaters like the Aello Cinemax 5+1 at 140 Patission which shows a mix of English and foreign language first run films with Greek subtitles and Greek films too. The 5+1 means it has 5 indoor theaters and one Therini, which is an outdoor summer theater. The Illion at Troias 34 and Patission Street shows Greek and foreign films as does the Trianon Film Center on Kodriktonos and Patission a block closer to downtown and the Filip on Thasou 11 near Platia Amerikis. There used to be a lot more but with the popularity of videos only true movie theater lovers choose to see their films this way. Plus with the Africans often selling pirated DVDs while the movie is in the theater and sometimes before, the days of these theaters may be numbered. You can find out what is playing at the movies by checking the weekly newspapers Athens News and Athens Plus, as well as Athinorama and the Kathimerini in the International Herald Tribune which comes out every day but Sunday. And if this is not enough there is the Metropolitan Bowling Alley at 122 Patission Street that is open until 3am!